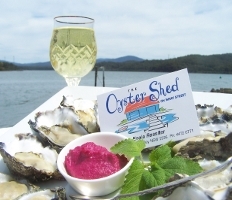 The Oyster Shed on Wray Street is located on the banks of the beautiful Clyde River at Batemans Bay. The Oyster Shed is a "farm gate" for fresh oysters sold direct to the public. Our Oysters are sold either opened, for your immediate enjoyment, or un-opened, for extended shelf-life or if you enjoy that extra freshness. Not only does The Oyster Shed offer farm fresh oysters, the view of the surrounding area, including the Clyde River, is just spectacular. We therefore invite you to come and enjoy the beautiful panoramic views while you relax and indulge in our fresh oysters. Opened oysters must be stored in the refrigerator at 4'C, and will keep for 7-10 days. When traveling, it is best to keep them in an esky or cool bag with enough ice for the journey. Put the oysters into fridge on arrival. 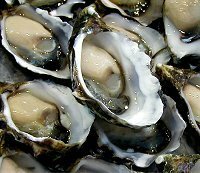 Ensure they are covered with plastic wrap or a wet cloth to keep them moist and to exclude the fridge odours that can contribute to deterioration of oyster quality. Unopened Oysters are still alive in the shell, and will keep in good quality for up to 2 weeks. Refrigeration of unopened oysters is not recommended, as this will kill the oyster. Unopened oysters are best stored between 8'C-15'C and out of direct sunlight.